The Sheriff's Off-Road Safety (SOS) Team provides targeted off-highway vehicle recreation areas and through education and enforcement of OHV enthusiasts with safe and enjoyable OHV recreational opportunities. 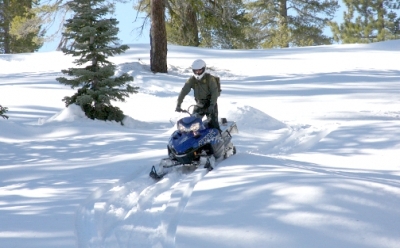 Fresno County offers year-round recreational riding opportunities off-highway and over-snow. 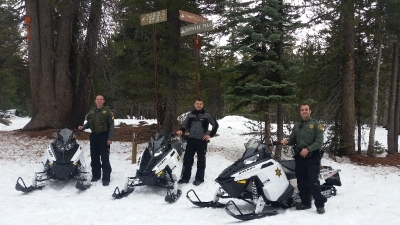 The Fresno County Sheriff's Office offers a new year round Off-Road Enforcement Team specializing in off-road law enforcement, search and rescue missions, medical assistance, and public education throughout Fresno County. The SOS Team has the ability to resolve many off-road related problems that are otherwise difficult for Deputies to deal with. Specialized equipment allows Deputies to rapidly move from on-road to off-road situations to locate, contact and bring closure to many problems. 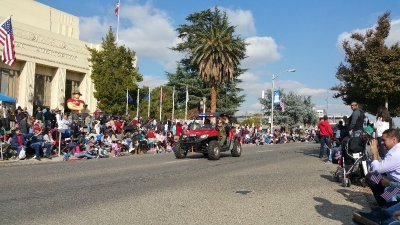 The Fresno County Sheriff's Office uses motorcycles, four wheel drive trucks, ATVs and snowmobiles for the SOS Team. The Off-Highway Motor Vehicle Recreation Program was born in 1971 out of the critical need to better manage growing demands for off highway recreation, while at the same time foster respect for private property rights and protect California's natural and cultural resources. Program funding comes from fuel taxes that are attributable to the recreational use of vehicles off-highway, OHV registration fees, and fees collected at the state vehicular recreation areas. A green or red sticker issued by the Department of Motor Vehicles. A street-legal license plate for four-wheel drive vehicles and dual-purpose motorcycles. Safe Operation. You may not drive an OHV in a manner that endangers the safety of other persons or their property. No OHV shall exceed 15 mph within 50 feet of any campground, concentration of people or animals. Mufflers. All motorcycles must be equipped with a U.S. Forest Service approved and working spark arrester and muffler. Lighting. OHV's operated between sunset and sunrise must have at least one headlight that allows the operator to see for 200 feet and one red taillight visible for 200 feet. Crossing paved roads. Two-lane highways may be crossed at right angles to the direction of the highway. Alcohol. It is illegal to possess an open container of an alcoholic beverage while riding or operating an off-highway vehicle. Please remember these are only a partial list of laws pertaining to OHV riders. For a complete listing, see Division 16.5 of the California Vehicle Code available at DMV offices. Eastwood Snow Park with groomed snowmobile trails. 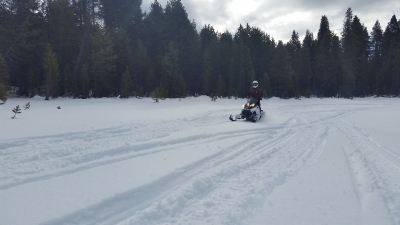 Huntington Lake Snow Park with groomed snowmobile trails. 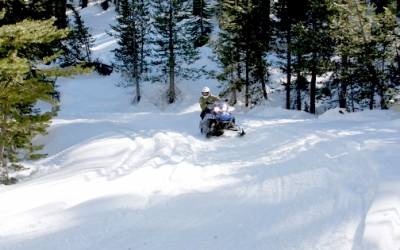 Tamarack Snow Park-Groomed snowmobile Trails. Red Mountain OHV Routes including West Lake, Strawberry Lake, Red Mountain, Coyote Lake and Mirror Lake. Other High Country Vehicle Routes include Hooper Diversion Dam, Bear Diversion Dam, and Onion Springs Dam. Stay to the right side of roads and trails. Approach hills and curves with caution. Assume there are vehicles ahead. Go with a friend. Two heads and two vehicles are better than one. Always tell a responsible person where you are going (in detail) and when you will return. Ask the person to notify the Sheriff's Office if you do not return. Allow extra room and stopping distance when approaching other vehicles, especially younger riders who may be less experienced. Always wear appropriate safety equipment. The SOS unit provides personnel and equipment to schools, civic groups, public meetings, and organized off-road organizations to explain the department, and its goals and objectives. The SOS Team is equipped with specialized vehicles and equipment to respond to medical emergencies in difficult or remote terrain for medical assistance and /or evacuation when required. The SOS Team will assist the Office’s Search and Rescue Unit as needed. The Off-Highway Motor Vehicle Recreation Program was created in 1971 out of the critical need to better manage growing demands for off-highway recreation, while at the same time foster respect for private property rights and protect California's natural and cultural resources. Please click the link to download and view the "OHV Grant 2016" PDF document.